A company founded by a Teesside University graduate is now handling more than a quarter of a billion pounds of bookings each year. Booking Live which was set up by Teesside alumnus Vinnie Morgan has clients across five countries and has worked with prestigious names such as television chef Rick Stein, Transport for London and the Baku 2015 European Games. The company, which is based in Bristol, designs bespoke online booking systems and was developed at Teesside University with the help of its DigitalCity and graduate enterprise initiatives. It has grown to employ 10 people, as well as six extra staff overseas. The company has its sights set on further overseas expansion and is looking to attract £250,000 investment to enable to increase its offer to businesses. Vinnie, who is originally from South Wales, first developed the company after finishing his MSc Visual and Web Apps at Teesside University in 2008. Through the course of his degree he was given advice and assistance by the graduate enterprise programme and picked up a number of awards including entrepreneur of the year and best new business, as well as plaudits at ExpoTees, the University’s annual showcase of digital talent for final year’s students in the School of Computing. Upon graduating he founded his business, originally conceived as a digital agency, and worked with the DigitalCity initiative based at the University, taking part in the Fellowship programme as well as an 18 week ‘bootcamp’ and expert mentoring. After being asked by one of his clients to design a booking system for a nationwide ‘zorbing’ company, Vinnie hit upon the idea for Booking Live. The company now has more than 150 global clients including 6% of all the local authorities in the UK. Many of his clients have tripled their footfall over the last three years. The company is looking to expand overseas into the United States, Australia and Europe. It is also hoping to develop a range of mobile apps and electronic point of sale (EPOS) software. Vinnie said: 'We’ve got some ambitious plans and the company looks set to have a great future. 'We’ve come a long way in the last few years and done some work with some very interesting names. 'I wouldn’t have a company if it hadn’t been for DigitalCity and the University’s graduate enterprise programme. Laura Woods, Director of The Forge, Teesside University’s business hub, said: 'Booking Live is a fantastic example of a business which is using innovative methods and new technology to satisfy a demand in the market. 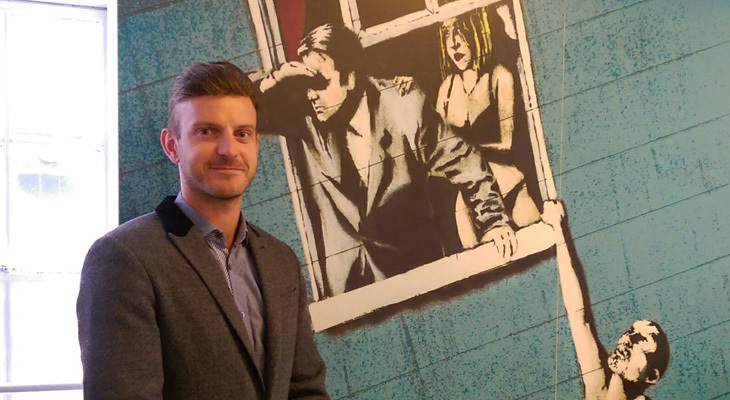 Booking Live, set up by Teesside University graduate, Vinnie Morgan is now handling more than a quarter of billion pounds of bookings each year.